W300 comes equipped with a 16-MP backside illuminated CMOS low-light sensor with a Macro Mode function that when turned on will help you portray even the most inconspicuous details in flowers, plants, insects and more. The display is sometimes uncomfortable to operate during the sunny days. The camera is a great choice for any individual that doesn't shy away from the dangerous situations and rough environments and wants a model that will be able to keep up with him. 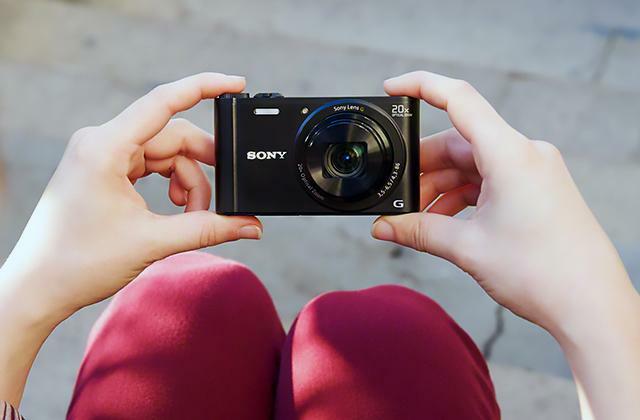 With the OLED-screen display and the Clear Color technology, your photos will always look bright and natural on it. And thanks to the Anti-reflection coating and well-backlit display editing photos will be way easier. Zoom switch could be more convenient to use. 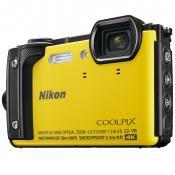 The Nikon COOLPIX AW130 is an inspired choice for any diver who wouldn't like to count meters underwater to record this incredible world. With this model, you can dive down up to 100 feet and always come up to the surface with great shoots. The Underwater Face Framing function looks for facesand takes a picture the moment it identifies one. The Scene Auto Selector feature helps the camera figure out the kind of picture you're looking to take and set an appropriate mode without involving the user. The shutter speed is a bit on the slow side. 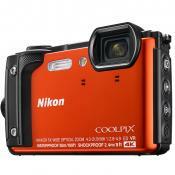 The Nikon W100 will prove to be a perfect choice for the technophile crowdand the extreme photography enthusiasts. With the help of the camera's cutting-edge shooting features, you will be able to take high-quality shots andshoot awesome films regardless of the surrounding environment. 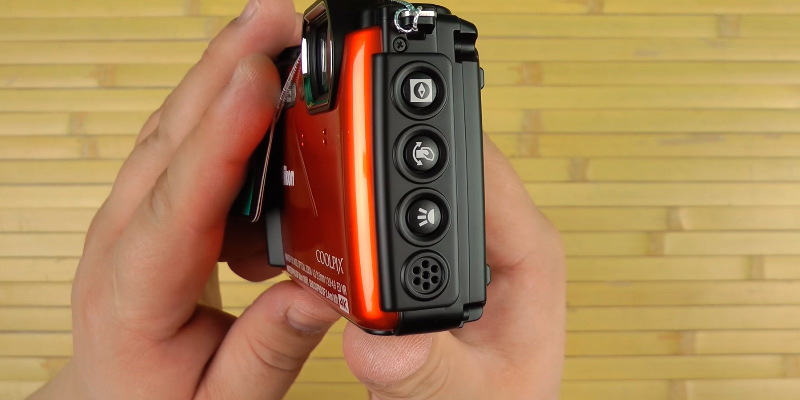 Various additional modes in this waterproof digital camera increase the shutter speed and help determine a person under the water. And a couple of useful extras that come in the box (16 Gb memory card, a tripod) save you money on accessories. Only 3x optical zoom magnification. Undoubtedly, this camera is the best choice for active people who need a camera surviving in conditions, which the conventional models are so scared of. Considering this, you can safely give it to your child without worrying that the next day the camera would be sunk or broken. When you turn the action control on, all buttons become more sensitive to make it much easier to switch modes and adjust the camera while wearing gloves, for example. The HDMI interface could be more modern. 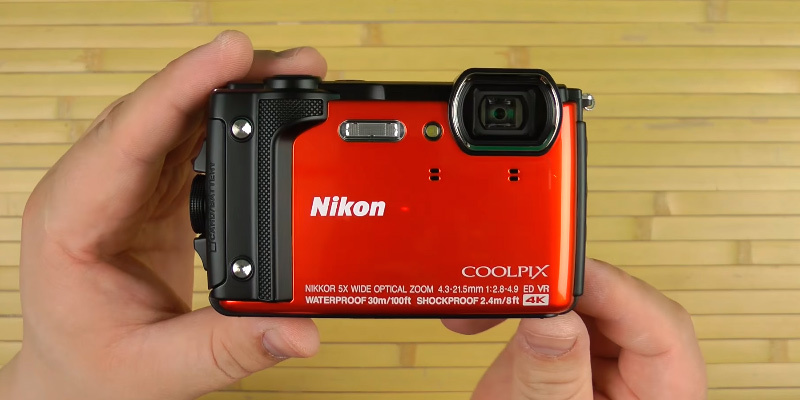 Excellent picture quality, 19 scene modes, manual white balance control, and pretty fast shutter speed are only a few features that put this Nikon waterproof camera on par with many more expensive rivals. Although people in the middle of the 19th century when the first camera was just being invented and introduced to the public probably wouldn't even dare to dream it, in the modern world most people own at least one capturing device and virtually everybody used one of them a few times in their lifetime. But just because a camera or any other device that has the similar features is a handy tool for a variety of possible scenarios that individuals may or may not encounter some time in their life, that doesn't mean that everybody is a huge fan of the process of filming videos and shooting photos or the outcome of being in a motion picture or becoming part of an image. Some people love it though and it is hard to blame them for that. Shooting a video or a series of photos is not only a fun activity that you can enjoy regardless of your company or lack thereof, but it is also an art form that requires a tremendous amount of technique and the skill ceiling is virtually nonexistent when it comes to it. People shooting photos or videos have to consider the background and the foreground, the proximity of the desired object or subject to their camera, whether the framing is straight enough and the last but not least is the aspect of lighting which is a separate art form in itself. Naturally, not everything comes down to the skill of the user and a lot depends on the quality of your camera. And if the quality is what you're looking for, Nikon is always there for you when it comes to optics and imaging products, with their new W300 waterproof model upholding the companies' standards of delivering top-notch cameras to their loyal customers. When it comes to a camera, one of the first things people pay attention to is rightfully the quality of the video that said camera is capable of shooting, generally manifesting in the highest possible resolution that the device supports. And since the model in question is Nikon, it comes as no surprise that the model is capable of shooting in 4K Ultra HD or 1080p Full HD videos with stereo sound. Thanks to the Short Movie Show feature, you'll be capable of combining your favorite clips into 30-second compilations and providing some background music and special effects with just a few clicks and no effort required. The W300 is equipped with a 16-MP backside illuminated CMOS low-light sensor with a Macro Mode function that when turned on will help you portray even the most inconspicuous details in flowers, plants, insects and more. 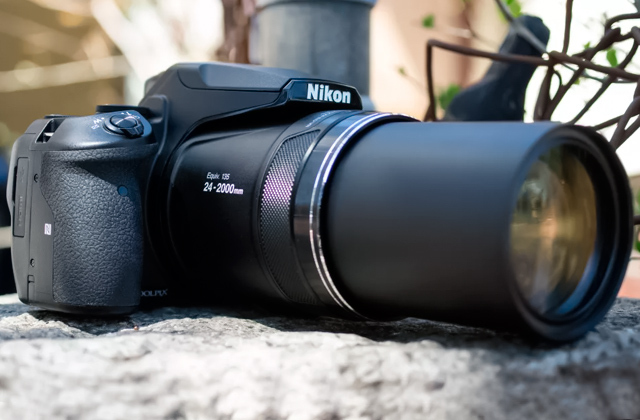 It also comes with their own NIKKOR lens capable of 5x optical zoom and equipped with a hybrid vibration reduction feature that will keep your photos and videos steady, even when the path ahead gets bumpy. 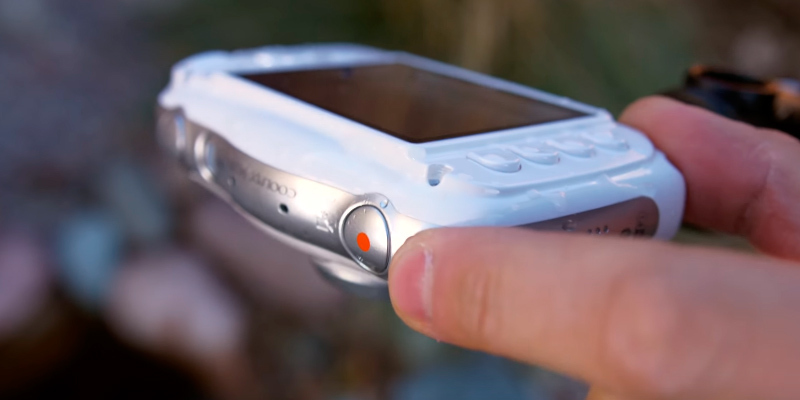 Naturally, since the model in question is advertised as a waterproof underwater digital camera, you would expect it to hold up even in the most extreme conditions. And your expectations would not be misguided since the W300 is capable of handling anything that you throw its way. The camera is waterproof down to 100 ft so you can take it with you on your snorkeling or scuba diving sessions or if you just simply wish to shoot in a pool. The model is freezeproof of up to 14°F, so skiing, snowboarding, sledging or any other exciting winter activity is an option that is available to you. 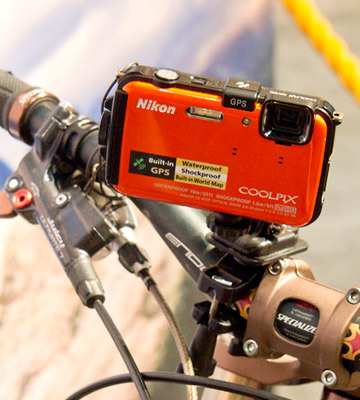 Last but not least, the camera is also shockproof and dustproof, meaning you can take with you on you dirt biking or just down to the beach and you won't have to worry about what happens if you drop it or if some sand or dirt gets in the way. The camera is incredibly easy to control with a large 3.0-inch LCD screen and a dedicated Tool button gives you quick access to GPS, eCompass and other features. Some people may find the model to be a bit pricey, but with the kind of quality and resistances it provides, the Nikon W300 is worth every penny of that price tag. Easy to use! I literally pointed and shot. I liked the latitude of ISO which allows decent Low light shots. And video worked well too. The monitor display on this W300 is so much better than the one on my old DMC-FX30 that it is now much easier for me to notice when the exposure needs adjustment. It's size and durability, insure that I'll always have it ready, when I'm in the water. It's simple to use, and can take a beating. Good battery life as long as you don't forget it is on. Nikon is among the leading manufacturers of high-quality cameras, though the company isn't really known for its models for underwater shooting. However, the AW lineup is surely worth your attention. The AW130 waterproof camera we chose for the review has a compact and lightweight casing that reliably protects the hardware and optics. Compared with its preceding models, this device has many innovative features that make it a fantastic assistant for active people who adore extreme sports. First of all, the AW130 has a revamped casing with a kind of bulge that makes holding the device more convenient even if your hands are wet. 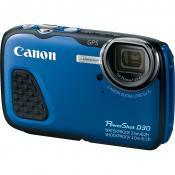 As for the waterproofness, this camera can be immersed down to 100 ft, more than enough for a novice diver or snorkeler. As for the temperature range, the camera can operate at temperatures down to 14°F. Needless to mention, the unit is dustproof and survives drops from up to 6.6 ft (more than an average human height). Such an impressive protection level makes this waterproof camera an excellent choice for shooting videos and taking pictures in quite extreme conditions, whereas a built-in GPS will let you know where exactly you are and where each photo is made. Moreover, you can create a location log and keep track of your route and store other similar data. 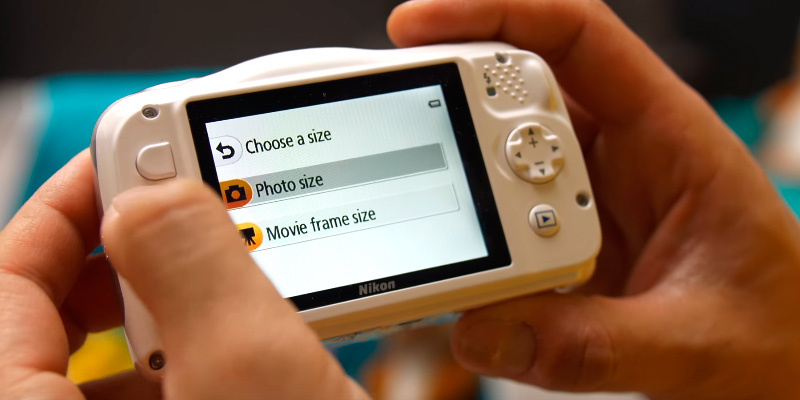 Travelers will certainly appreciate this device from Nikon! 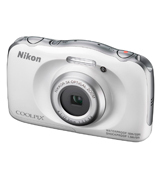 The Nikon Coolpix AW130 has extremely powerful EXPEED C2 CPU which ensures fast image processing and outstanding picture quality. The sophisticated vibration reduction system (VR) makes up for a minor trembling of photographer's hands, which is particularly important while shooting videos or taking pictures of the moving objects. The waterproof camera has a number of useful pre-set modes that you can choose in order to get the optimal settings for a specific situation. 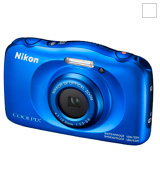 As for videos, this Coolpix camera can shoot Full HDs (1080p) with a decent detailing and a stereo sound. The high-aperture lens, a powerful flash, and an automatic focus adjustment allow you to make stunning underwater photos. 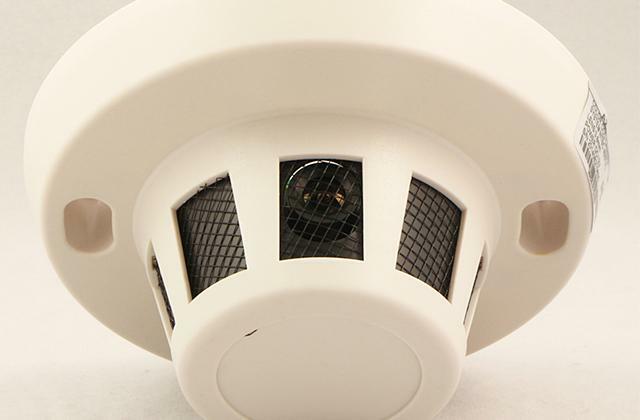 Since this camera has been designed to be used in extreme conditions, it doesn't feature any small buttons. 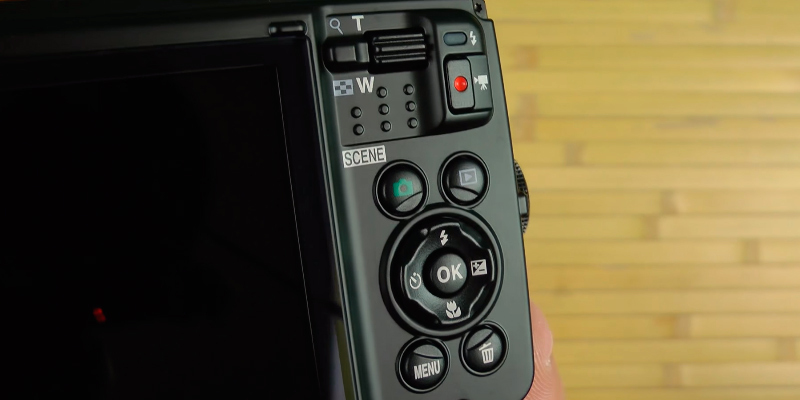 Instead, it's got a unique active control that allows performing a certain number of actions by mere tilting or shaking the cam. No doubt, divers and fans of winter sports will duly appreciate it! The Nikon AW130 operates really fast: it boosts and focuses in no time while the image quality is really high. The high-aperture lens is able to make detailed photos and videos of underwater and performs really well under low light conditions. The camera has a 3-inch high-resolution display with an OLED panel and provides wide angles of view. 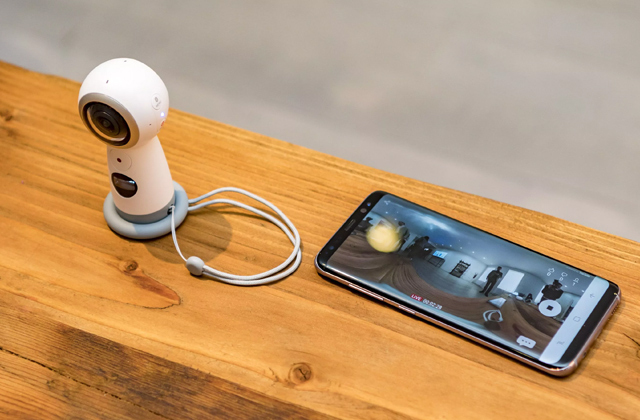 With this cam, you will be able to take pictures, browse the menu, and review the shots while being on a sandy beach or on a snow-covered mountain slope. 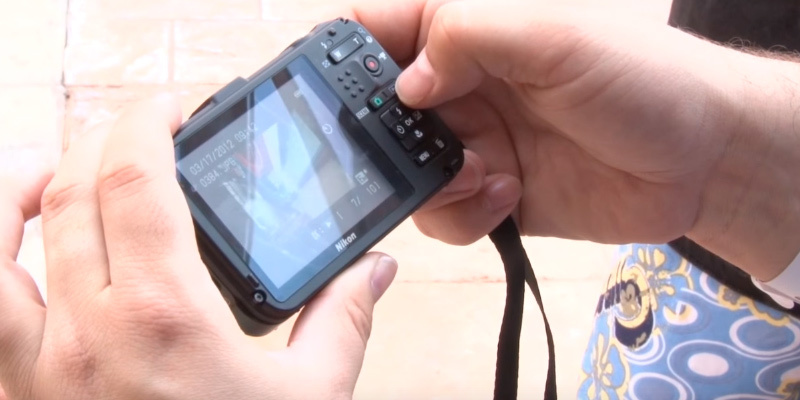 The Nikon AW130 has a GPS, a map and a switch to the action control that prevents the buttons from accidental pressing. Some customers might think that the number of manual settings is rather scarce which is quite true, yet, as the camera's designed for active users and extreme conditions, it doesn't need to be overcomplicated too. 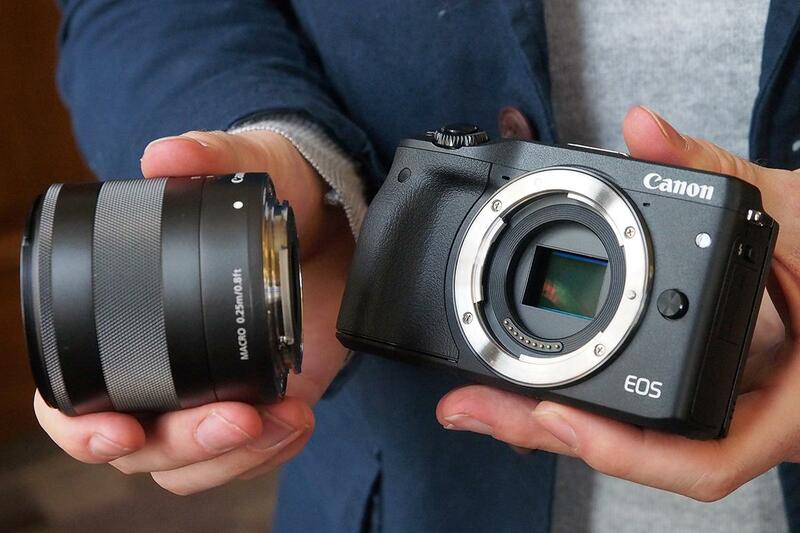 Image quality is better than I expected for compact cameras in this price segment. excellent full-auto focus and exposure control: fast and spot-on. Camera takes nice pictures both in and out of water. I can take it ANYWHERE! Battery life is excellent. It is light weight, small, shock resistant, waterproof and dust proof. Convenient in the pocket if you want. good large screen to view subject. 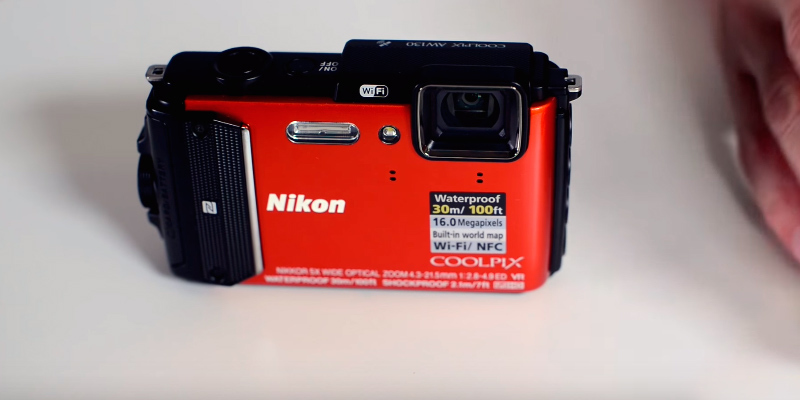 The Nikon W100 is the kind of waterproof camera that is mostly defined by all of the extra features implemented by the Japanese optics manufacturers. All of these extra features may not provide enough to make the camera in question one of the best options on the market but they certainly add enough value to attract the technophile crowd and the extreme photography enthusiasts. For starters, we would like to direct your attention towards the Nikon's very own Target Finding Autofocus technology that does a pretty remarkable job of automatically locating the intended subject within the frame. That said, snapping pictures underwater can be one hell of a task but not with the help of the Underwater Face Framing function. When activated, the feature looks for faces and takes a picture the moment it identifies one. And since this is a Nikon camera, the folks behind it didn't forget to include the Scene Auto Selector. In case it doesn't ring any bells with you, the said function helps the camera figure out exactly what kind of picture you're looking to take and set an appropriate mode without involving the user in this tedious process. A waterproof camera is synonymous with extreme sports and some of the most exhilarating outdoor activities, which is why no good camera like that would be complete without the Motion Detection technology. Simply put, the technology helps the user snap sharper images by automatically selecting a faster shutter speed and higher ISO (light sensitivity) setting. The idea behind it is to compensate for subject movement or camera shake. 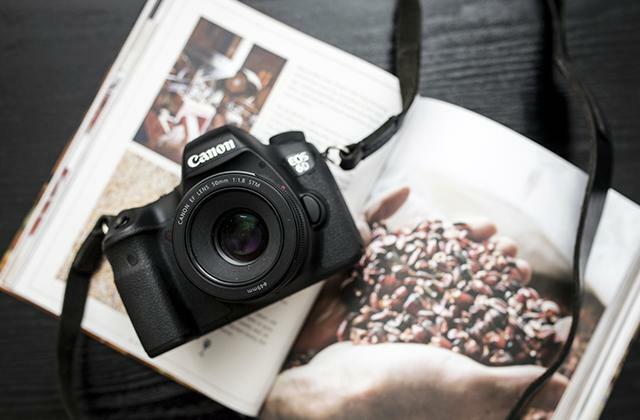 With this technology in your arsenal, you won't have to worry about choosing the right camera setting and simply enjoy the freedom of taking great pics whenever you want them and however you want them. And if that doesn't sound sufficient enough for you, the underwater camera also offers the VR image stabilization technology that works in conjunction with Motion Detection by detecting horizontal and vertical movement and offsetting that movement with compensating motion. As a result, you'll get sharper shots and you won't even have to rely on a tripod or flash for help. 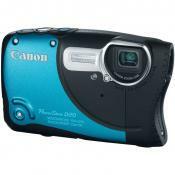 Aside from all of these features, what we have here is a relatively standard waterproof camera. 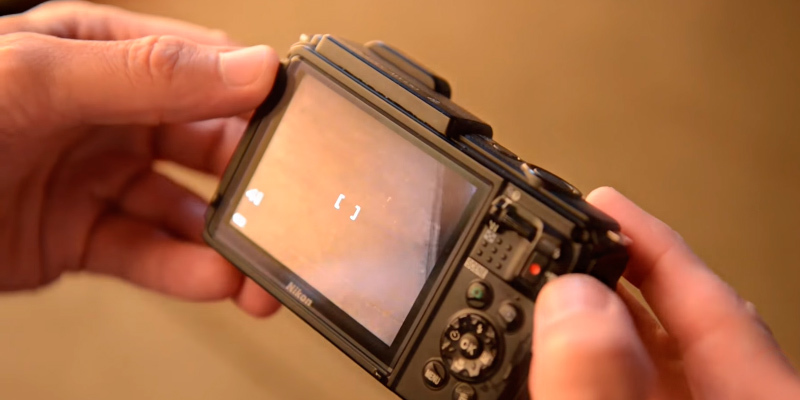 A sensor will ensure a sufficient amount of image clarity. 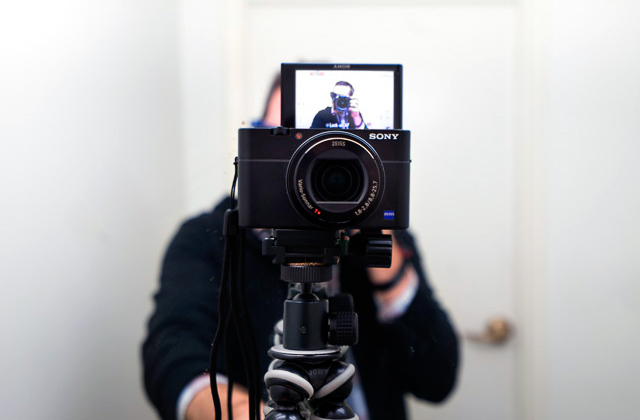 With the help of this sensor, you will be able to shoot videos in Full HD at 30 frames per second. The camera is compatible with a SnapBridge app, so you'll also have the opportunity to automatically transfer images to your smart device for easy sharing and storage. To sum it up, the Nikon W100 will prove to be a perfect choice for the technophile crowd and the extreme photography enthusiasts. With the help of the camera's cutting-edge shooting features, you will be able to take high-quality shots and shoot awesome films regardless of the surrounding environment. Every holiday is an exciting experience, thinking of which all sorts of pleasant memories float to our mind. And having got pictures in the album makes it only more vivid and real-life. This is where now you can think of many moments which you’d be happy to shot but had to desist from doing so for fear of damaging the expensive camera equipment. Don’t hold yourself back anymore. 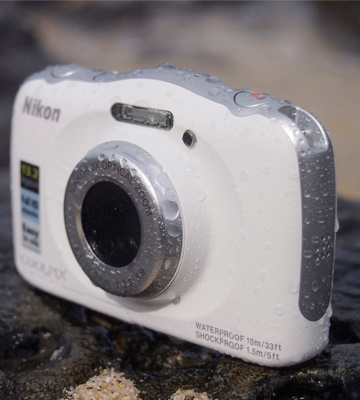 Opt for the Nikon waterproof camera and use it to the fullest. The waterproof camera is rather small in size but its features are absolutely amazing to take pictures of the underwater scenes and on mountain resorts. Similarly to pro cameras, it can focus on a face and catch every emotion to convey it onto a shot. You only need to press a button. The navigation menu isn’t cluttered with any complicated functions and intuitive for people of any age. So, even if there’s only you and your child on the beach, you can give it to your little one, asking him to record you in the sea and he will cope with the task brilliantly! 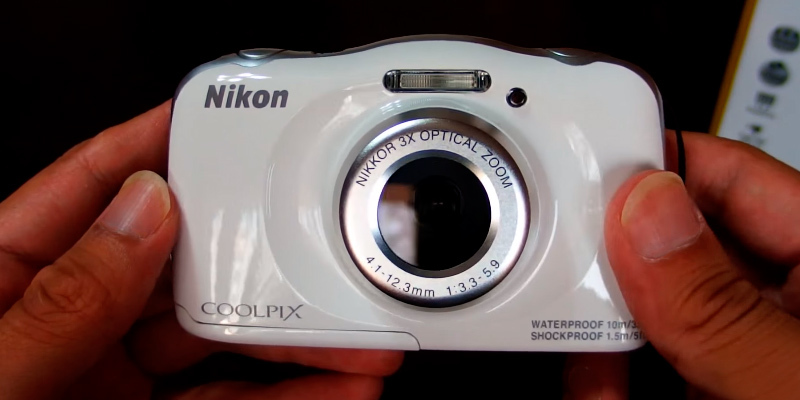 The picture quality of this Nikon waterproof camera is above the average level considering a relatively small 13.2 MP CMOS sensor with the size of 1/3.1” and non-telescopic lenses with 3x optical zoom. Magnified views are of the same good quality without noises and blurring as the pictures are shot without zooming. Yet if the 3x zoom is combined with the Dynamic Fine Zoom mode, the wide-angle lenses of the Nikon waterproof camera may provide the actual magnification of up to 6x. 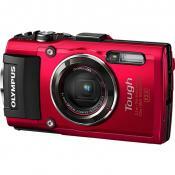 This enhanced zoom function allows you to make close-ups of active sports, wildlife and much more. The menu includes 16 various shooting modes for you to select the best one according to the ambient light, scene and weather conditions. Automatic adjustments perfectly work even for the underwater scenes. Additionally, your family will have a lot of fun applying pre-set special effects. These fun effects include the Miniature mode that may convert the picture in such a way that people, cars, streets, trees, and other objects will look like toys. Your kids will surely love it. 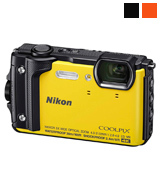 Nikon Coolpix waterproof camera has separate buttons for photo and video shooting. You can quickly switch from one mode to another one. 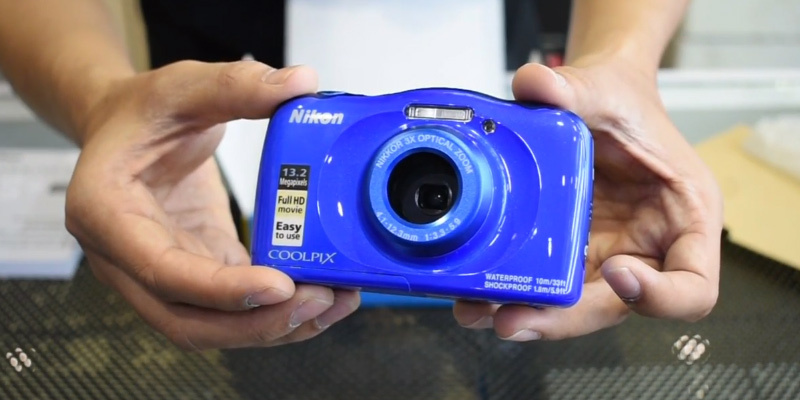 Nikon Coolpix S 33 is simple in use and it features a wide range of functions that make it the ideal choice for the family vacation! 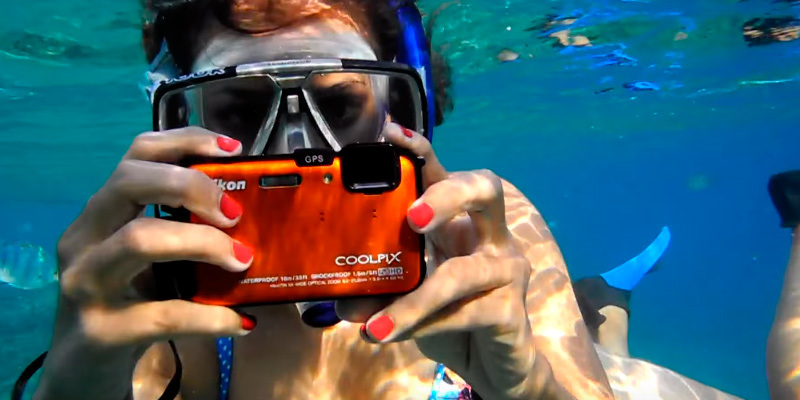 The COOLPIX S33 waterproof camera is a great device for a big family full of adventure. With its bullet-proof design and large control buttons, you can entrust it to your kids so that they could make their first steps in photography with ease and excitement. I'm stilling learning how to use it but love it so far. I like the size and love the bright blue color. Pictures were sharp and clear and the optical zoom make close ups of skittish fish a lot easier! Fantastic resolution and small and easy to handle. There are multiple shooting modes (called scene modes) , ability to take soft pictures, create diorama effect, shoot close ups, photograph food, firework mode,and of course underwater mode. All you need is a USB connection (which, by the way, comes with the product) in order to retrieve all of the files you would like to cherish. 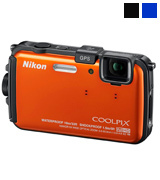 The Nikon COOLPIX AW100 is a rugged pocket size camera designed to record your adventures and sports achievements in tough conditions. This model is waterproof (33 ft), freezeproof (14°F), and shockproof (5 ft). It can survive accidental drops on the ground or stone with ease. 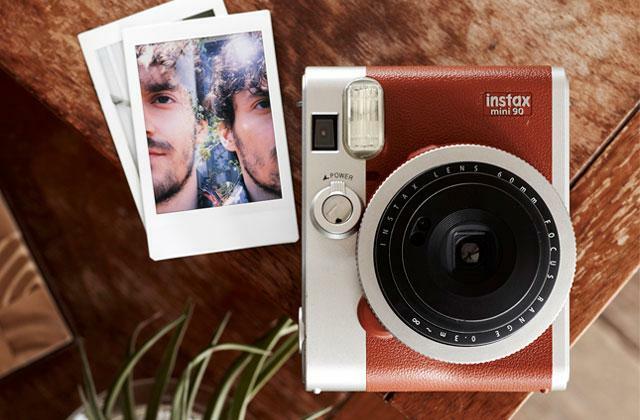 So if you are looking for the camera you can take on the camping trip or to the seashore with you and return home with a plethora of great pictures and an unbroken device, this model is up to the task. So what exactly can this cam offer in terms of picture quality? 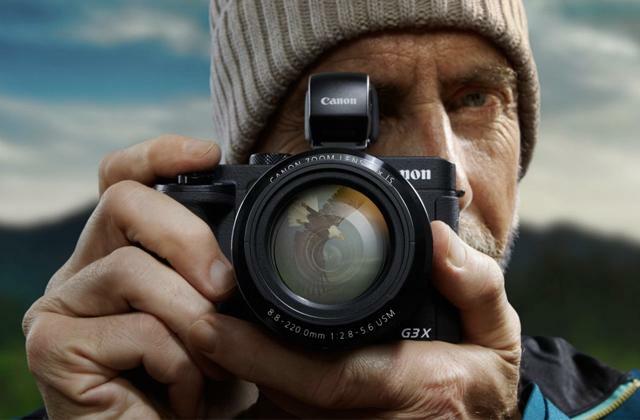 For starters, photos made with the COOLPIX AW100 benefit from the 16MP 1/2.3” CMOS sensor that makes them bright, sharp, and extremely detailed in the size of 4608 x 3456. Depending on the light conditions you are shooting at and the opportunity to use the flash, the ISO sensitivity can be automatically changed within the range of 125-3200. The best option is to try to shoot at lower ISOs and use the flash when it is necessary. The level of image noisiness is always higher when you choose for ISO 1200 and above. The shutter lag is very low with this model: only 0.2 or 0.5 seconds in bright and low light respectively. And shot-to-shot time won’t make you wait forever between shots: only 1.6 seconds without flash and 1.9 seconds with it. 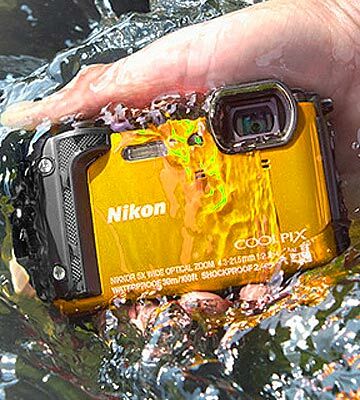 With the Nikon COOLPIX waterproof camera, you can record video in Full HD with the easy-to-edit frame and format it afterward if the need be. Or you can use the high-speed mode to capture your extreme tricks. Nikon always offers their users quite a lot of scene modes so invaluable for novice photographers. Their COOLPIX AW100 is not an exception, it offers you 19 scene modes among which are night landscape shooting, a one-touch 180°\360° panoramic mode, macro mode that lets you capture anything as close as 1cm from the camera lens, and of course, the underwater mode. With the built-in vibration reduction, you can always be sure that the image smearing from the slight camera shake will be minimal. And with the manual white balance control, setting up a camera for taking pictures of underwater world will be only the matter of a few seconds. 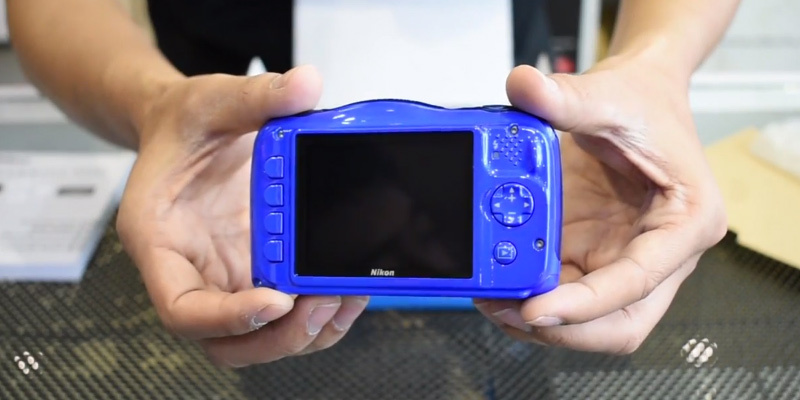 In addition, Nikon features a built-in GPS, mapping, and e-Compass. Frankly speaking, not all users would really need these features, but having your images geotagged and documented via Nikon’s ViewNX2 software that is included can be handy. 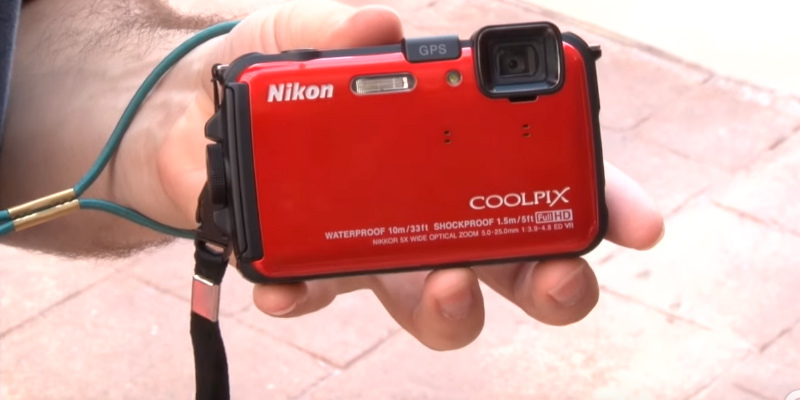 Being made for use under different environmental conditions, the Nikon COOLPIX waterproof camera was equipped with the action control. It makes all the buttons a bit more sensitive so that it would be easier for a photographer to handle the camera controls in gloves. Without a doubt, picking this camera for the first time, it feels like a bullet-proof device that will produce excellent photos even after being hit over a rock or dropped into the river or ocean. 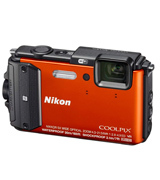 And while it may not seem very feature rich for a professional photographer with years of experience, especially in terms of manual control, the Nikon COOLPIX AW100 will definitely please a less demanding user with the variety of shooting options both at home and in the wild. 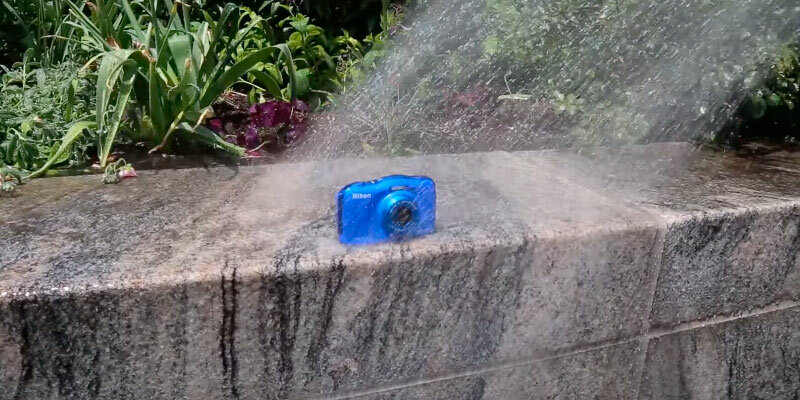 What Is a Waterproof Camera? Every one of us has those special moments that we wouldn’t want to forget. The biggest fish you have hooked in your life, the first swimming experience of your child, the first contact with an incredible underwater world of the Red Sea—indeed, there may be so many occasions too important to be missed. This is where having your camera handy at the crucial moment is a must. 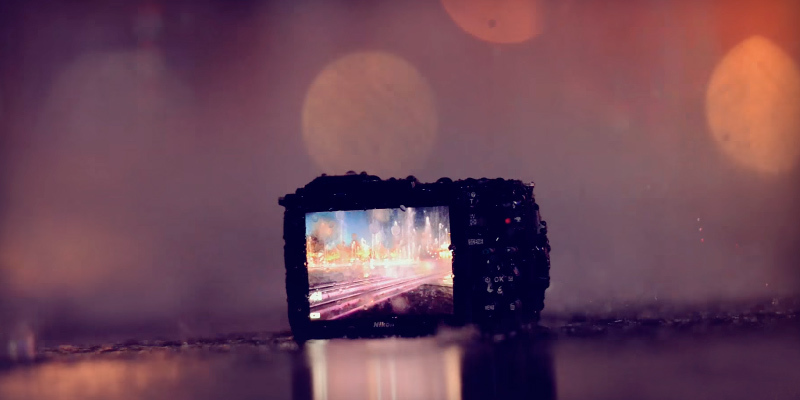 At the same time, when it comes to shooting in extreme conditions such as under the rain, in the sea or freezing temperatures, a good waterproof camera is your best assistant. No matter how detailed and bright landscape pictures your DSLR camera produces, it won’t thank you for using it anywhere near water, now, will it? Waterproof cameras are made to last. They are resistant to hits and falls, sand, dust, water, and freezing. 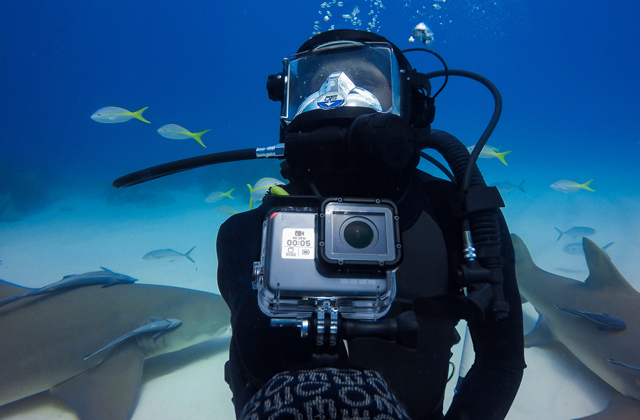 With such a device you can easily take photos and videos of deep-sea inhabitants up to 100 feet underwater as well as capture your or your significant other’s water-sports achievements. 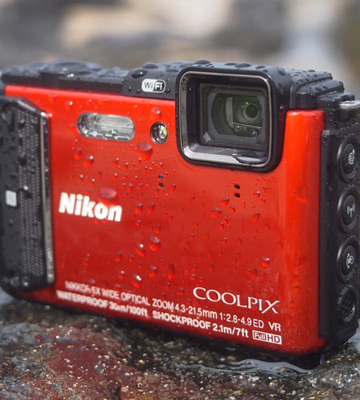 We wouldn’t hesitate to take a waterproof camera when going camping or mountaineering either, because it is durable enough to survive accidental drops on rocks or into the mud. 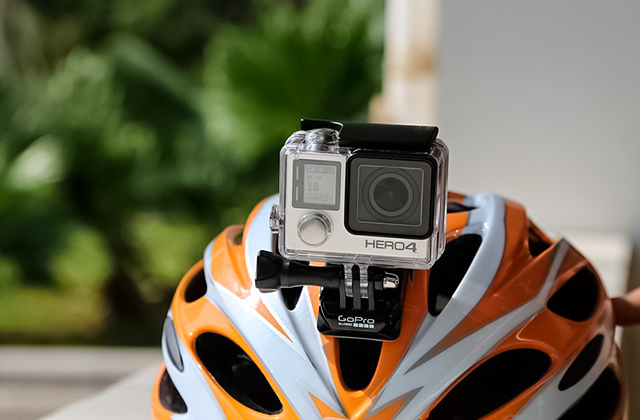 At the same time, if you are fond of extreme outdoor activities and always need your hands free, an action camera will be more convenient to use. It also offers excellent quality of shooting but can be hanged around your wrist or attached to your helmet. 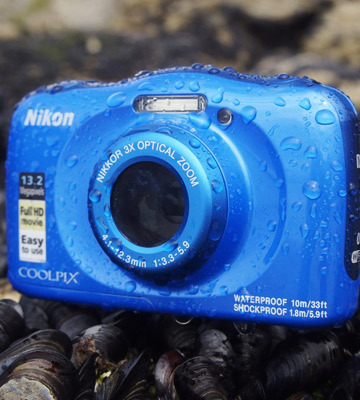 In this review though, we’d like to tell you about waterproof cameras by Nikon, the company that is well-known worldwide for producing top-notch imaging products and microscopic solutions for any taste and budget. The first question one needs to answer when selecting their first waterproof camera is what exactly they need it for. For example, if you presume that you will mostly record your kid swimming in a pool or landscapes in the rain on and off, then the highest water protection isn’t a priority. In this case, the immersion capabilities of up to 30 feet can give you enough freedom to take great shots. But if you are a diver and fond of underwater photography, then water resistance must be higher. For these occasions, there are models designed to withstand immersion to up to 100 feet. For mountaineering and ski activities, the cam should also be freezeproof, shockproof, and crushproof. In other words, your camera should be secured from external impact so that it could be used in any extreme conditions and still run faultlessly. Waterproof cams are not only for shooting in bad weather anymore. Today, the most advanced cams can rightly be put on the same shelf with many top-notch devices. 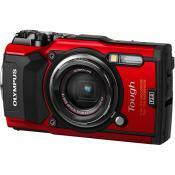 They boast a large sensor size, a high picture resolution, good zoom and high-quality lenses. The number of pixels can vary from 8 MP to 16 MP. When it comes to the sensor, the bigger is always the better. The most compact sensor that will produce a nice bright picture is about 1/2.3”. This is the lag time between the moment you press the button to take a shot and the moment when the shutter opens. In other words, when looking at the LCD screen, the picture you see there may slightly differ from the picture you will end up with. This difference can be notable when taking photos of moving objects. Here, in contrast to the sensor size, the shorter the shutter lag is the better image quality you’ll get. As a rule, the shutter speed can be adjusted in the range from 1 sec or slower to 1\4000 sec, where the former setting will help you achieve the blurring effect and the latter will freeze an extremely fast movement for you. This feature is very important when shooting without strobes using natural light only. Such images taken under ambient light appear to be blue because of the properties of water and light refraction. Manual white balance adjustment helps remove this color cast. In order to enhance the user’s experience, most manufacturers add some useful features to their models. Thus, today, many of them come equipped with a built-in GPS and compass to let you track the location of a photo and even the direction you were taking it. 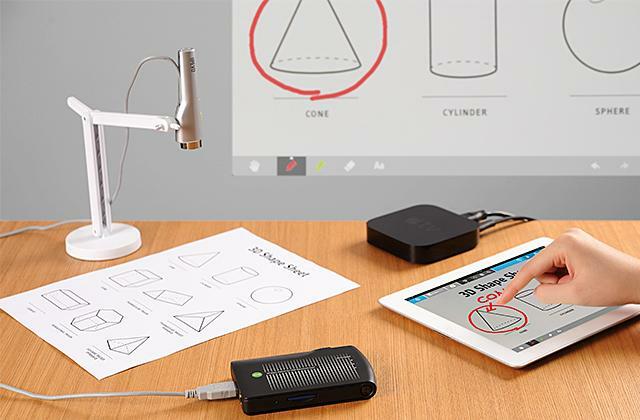 And the Wi-Fi connectivity is also a commonplace feature that makes sharing photos and videos on the Internet instant and as simple as ABC. Frankly, these features are not actually must-haves for a user, but they can really improve the operation of a cam.